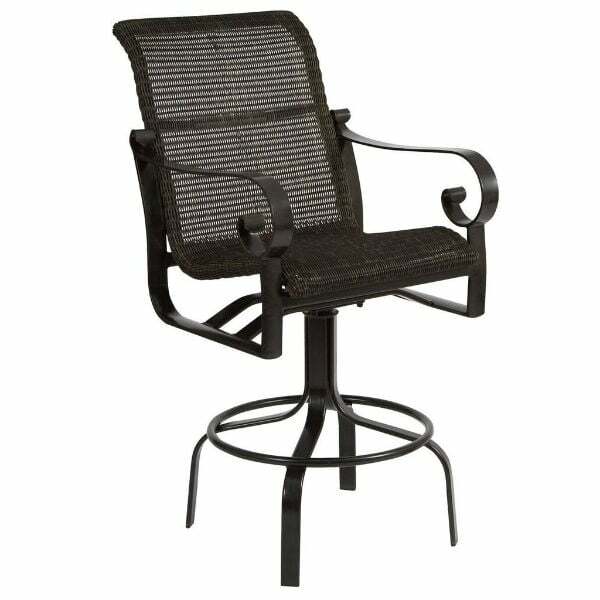 The Belden Woven Bar Height stool does not features an accompanying bar height tabletop. Instead, it is customizable by you so that you may match it with your favorite bar height tabletop from another Woodard collection of from another designer altogether. The seat features a strong frame, a high, supportive seatback, comfortable curling armrests and a 360-degree footrest. The frame is tough and durable, and the weave is forgiving to conform to the body of the person seated. The seat and seatback are made of HDPE weave that mimics the look and feel of traditional wicker but doesn’t rot, break, crack and fade like wicker does. The HDPE weave is customizable by you. Woodard offers a range of wicker styles to choose from. The selection is viewable by the link below. Dimensions 30.8" D x 25.3" W x 47.5"